Once in every generation there comes a film that fully sums up it's fears and aspirations. 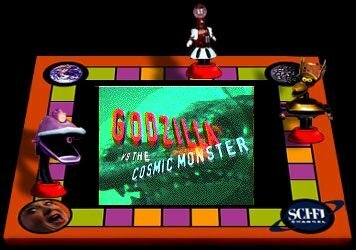 "Godzilla vs. the Cosmic Monster" is one such film. What we have here is a fully believable story about fey space "gangsters" that descend upon the earth to unleash the dreaded Mechagodzilla upon an old Japanese Santa Claus and his family. Godzilla, in a strange turn of events, actually appears to confront this terror. After a few days of fighting, the incredible Dogmonkeyman appears to lend a helping hand and bring justice to this foul creation of space science. Watch for the scruffy sunglasses-sporting "Interpol Agent" played by a young John Ritter. THX-1138> SEE the scenic lands of Japan. SEE the beautiful buildings that symbolize Japanese culture. SEE them all destroyed by huge monsters. dungarees> They're gonna spelunk! Should we be watching this? nicklby> look, they're filming Shogun! THX-1138> A hole in the ground is found, and Hard Copy is there. Q> we now pause for this totally unrelated and unnecessary pop music moment. enjoy. nicklby> so what do we have so far? bowleg> we've got a guy in sunglasses. bowleg> We've got a croaky voiced guy. bowleg> We've got a Japanese Santa. bowleg> ... and space titanium. bowleg> What's that you say? THX-1138> And where Kathy Lee is, Mr. Hat can't be far behind. Q> man, stupid buildings, i HATE buildings, building dropped me on my head when i was a baby. take THAT, you stupid building!!! THX-1138> The sun rises in the west...and sets in the east. Damn I'm good. nicklby> a planet where Charles Bronson evolved from men? nicklby> suddenly, two old Jewish men show up. bowleg> Care to explain your weirdass performance hotel clerk guy? THX-1138> Where are those damn Seven Samurai when you need 'em. dungarees> Are shapshifting gorillas in interpol's jurisdiction? Djenk> Ugly Naked White Guy Alert!!! THX-1138> This is no time to toke professor. Djenk> There was no puppydogmanmonkey..
bowleg> Sooooo.... what important lessons of life were learned here? THX-1138> I learned that bad singing will not only wake up the dead, but sleeping monsters. bowleg> I also learned that you should always keep an old Japanese guy in a robe around JUST IN CASE. "If I can get a scoop, I can make a lot of money. I hope you'll help me. HAHAHAHAHA." "This material can only be space titantium. SPACE TITANIUM? You mean it's really from outer space? Mmm-hmmm." "The key that unlocked the divine monster!" "Damn. We'll have to postpone our attack on Tokyo." These tattooed characters here represent an ancient kind of heiroglyphic writing"
"Enjoy yourselves... this is the last night you will have... eheheh..."
"Mechagodzilla: BEAT GODZILLA TO DEATH!" "So... he's transformed himself into a magnetic force!" "I can't believe it... The magnificent machine, Mechagodzilla... Has been defeated!" "It's alright. Your father. Has achieved. A victory."